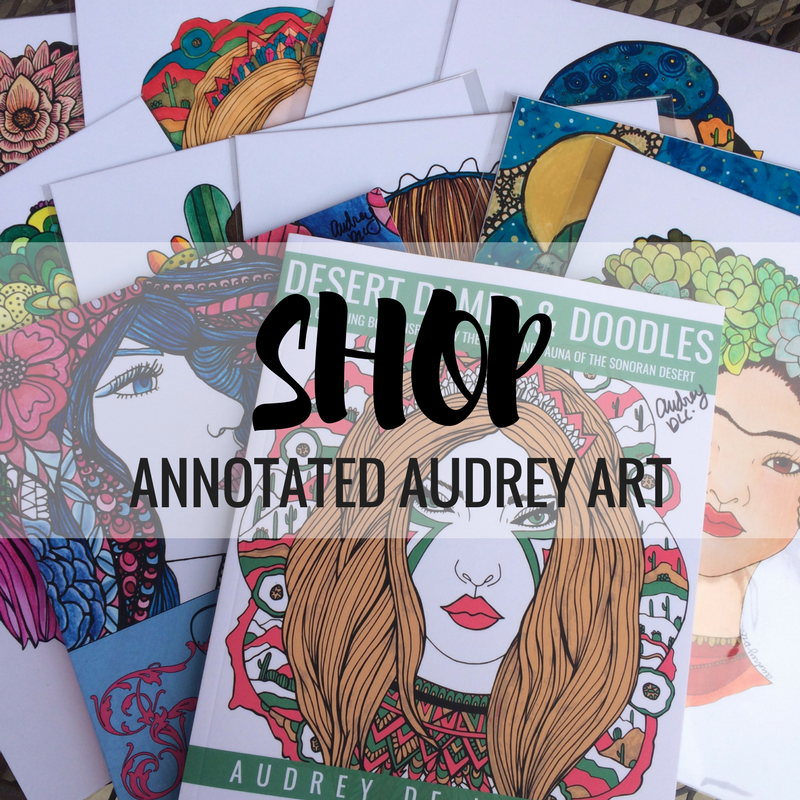 It’s going to be another busy week for Annotated Audrey Art. In addition to our usual markets, we are participating in Tenwest Fuse, a showcase of music and makers on Saturday (10/21) night. Also, opening on Saturday (10/21) night are two Day of the Dead themed art shows that I’ve created paintings for. Barrio Bones IV at Art House Centro and Phantoms at Pop-Cycle Shop. In this post, I will share the artwork that I’ve created for these shows, as well as a bit of info about the shows themselves. This piece entitled, “Journey to the Spirit World,” depicts the process of ascention and metamorphosis after death. Acrylic and Enamel Paint on Canvas (16 x 20). Original painting available at Art House Centro for $175. This piece entitled, “Night of The Spirits,” depicts the energy and vibrancy of the Tucson-specific celebration of the Day of The Dead. Acrylic and Enamel Paint on Canvas (16 x 20). Original painting available at Art House Centro for $175. “Candy Skull Frida,” is a tribute to one of my personal role models and favorite painters, Frida Kahlo. Her bold personality, compelling story and unique fashion sense make her a recurring inspiration for my art. Original 8×10 watercolor painting (in 11×14 frame) available at Art House Centro for $125. The Phantoms Art Show at Pop-cycle shop is a benefit for the All Souls Procession, which is a huge community event that is held in Tucson each year. (For more information about this event, click here.) The show will exhibit art from local artists exploring the theme of spirits and phantoms. “Candy Skull Girl,” combines themes from both Halloween and Day of The Dead. I love the graphic patterns and shapes in this piece… and of course, the pops of gold paint. Original 8×10 watercolor painting (in 8×10 frame) available at Pop-Cycle shop for $100. 100% of the proceeds from this original piece will go towards the All Souls Procession. This piece entitled, “Rosalee” is meant to represent a Tucsonan at the All Souls Procession. I remember going to the procession for the first time and being so impressed by everyone’s costumes and makeup.The All Souls Procession is a huge community event in Tucson and everyone goes all out… I love it! Original 8×10 watercolor painting (in 8×10 frame) available at Pop-Cycle shop for $100. 100% of the proceeds from this original piece will go towards the All Souls Procession. If you want to keep up with any local shows that I’m doing, you can check out my events calendar (here) or sign up for my mailing list (here).